In Unicorn Medieval wall tapestry we see a unicorn perched on a shield with the royal crest of the Le Viste family. The Le Viste family commissioned the unicorn and the lady series of tapestries and here we see a work inspired from a detail from those pieces with the unicorn and his cape and shield bearing their emblem. The unicorn is thought to represent healing power and purity and yet its meaning in the original series of tapestries remain a mystery. 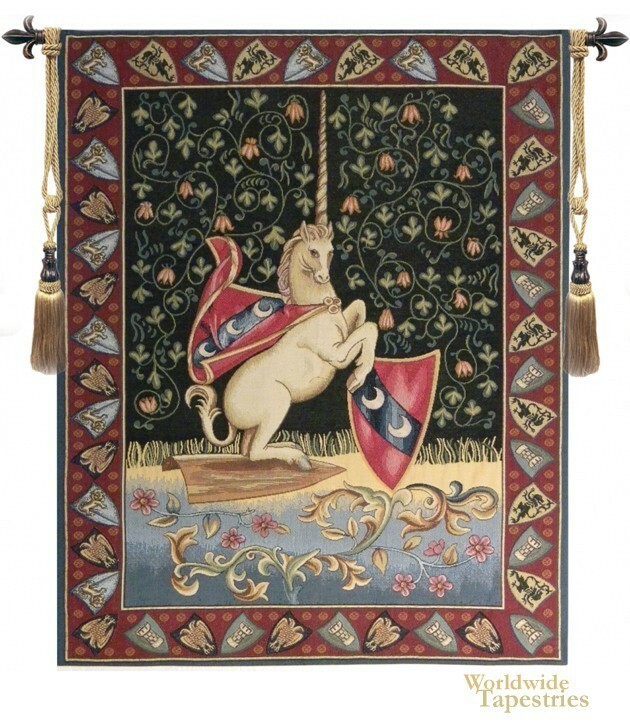 This unicorn tapestry Unicorn Medieval is backed with a lining and a tunnel for easy hanging. Note: tapestry rods and tassels, where pictured, are not included in the price. Dimensions: W 26" x H 33"